One half of a Victorian in downtown Rome, New York. Walking distance to Fort Stanwix. 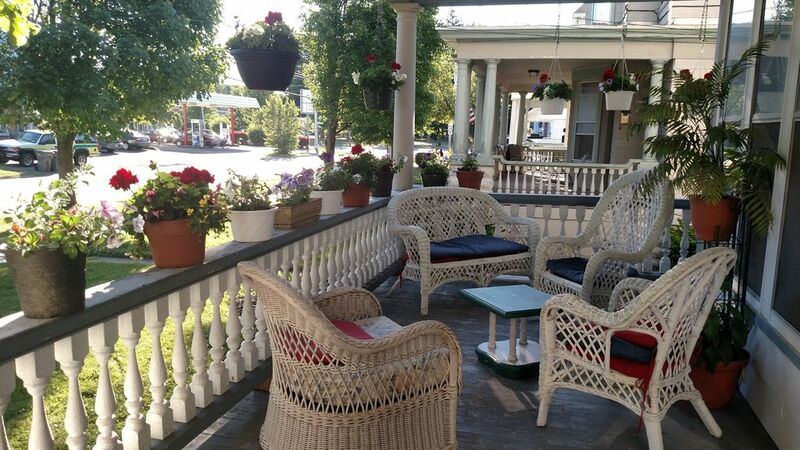 Located in the foothills of the Adirondacks, connected to snowmobile trails, and all the outdoors has to offer. Unit is completely refurbished with new carpet, paint, beds, and appliances. Has washer and dryer. Everything you need to be as comfortable as being at home. Unit has 2 double and 2 single beds. Can accommodate as many children as you need to. Pet friendly. Outside space for smoking. House is owner occupied with separating door secured by individual locks from both sides. Private entry for guests. Kristee was a gracious and friendly host, who went above and beyond to make sure I and my family were comfortable. We were there for a funeral, and she even thought to clip my grandfather's obituary from the local paper so I could have a newsprint copy of it! The rental has all the things you would get from a hotel, plus more space, a great kitchen to cook in, and in-unit laundry! Very convenient to downtown Rome. Off street parking was helpful. Great water pressure and hot water :) she even asked how we take our coffee and made sure to have our preferred accompaniments available in our kitchen. Would definitely recommend. There were 5 of us staying — 3 children and 2 adults. There was plenty of room, and we were very comfortable. Christee was very thoughtful and provided cream for our morning coffee. It was a very nice experience. Horrible. The pictured patio is not your patio! This place doesn't even deserve 1 star. The cute beautiful patio pictured is not your rented space, it's the owners' private space. She's dog friendly but the house and yard is not! You actually rent the back of her house that looks like it's under construction, the door frames aren't even framed out correctly with liquid foam exposed. The yard has holes in it and under the fence (probably from her 2 pit bulls she has and didn't tell us about) in addition to the yard, it has piles wood panels with 4 inch nails sticking straight up out of them. The house had a damp old smell to it. We did not stay here at all. It's in an unsafe area and the house is not safe to be in. The pictures she's showing doesn't match what is really there. The owner should have noted that she has 2 pitbulls. We have 2 teacup Chihuahuas and a Boston Terrier (he is blind). Her 2 pitbulls ran us out the house. The owner refuses to give us our money back and now going through it with HomeAway....we ended up staying at a motel 6 Suite and it was much better than this location. Beware staying here, the pictures are not what you get!!! Guest called me stating that upon their arrival they were greeted in my driveway by a drug dealer offering services, and had video of the interaction. I was mortified and concerned for everyone. Guest agreed to meet me for refund and furnish the video for me to present to local police department. My guests and family's safety are profoundly important. My Grandsons were visiting and also staying at the house. Upon my arrival 30 minutes after the call, the guests were gone, and wouldn't respond to my calls or messages. They never responded again. VRBO contacted me shortly after, but the concerns were different from her complaints to me. They ask for a FaceTime tour of property to confirm that it was as advertised,and stated the guests would be returning to the property to confirm that construction was completed and area clean and tidy. VRBO found the the space "beautiful and very neat" in the virtual tour, and confirmed that the photos were exact. I explained that a storm 36 hours prior had done some damage, and we had a contractor replacing door where window was broken by wind debris, and sofit torn off. VRBO even spoke with him to confirm this. We absorbed the cost with no insurance claim, so it could be safe and secure for guest arrival, without time constraints of an adjuster. The contractor had simply ran to Lowe's for a roll of insulation when they arrived, but everything was buttoned up by my arrival at the house. All areas are guest spaces on my property ! I use the front porch to collect mail and water flowers, but nothing else. Most of my guests have utilized the space with total privacy. As far as my Pit Bulls chasing you from the house. If you were that close to my rescue dogs, how could anyone mistake a AKC registered Standard Poodle for anything other than a poodle ? The pit mix has replaced hip from abuse. I designed this space to compensate for the income I would be losing during chemo treatment, and paid close attention to every detail. Every guest that has ever stayed has been extremely satisfied, and the reviews on two websites attest to that. Had the guest just met with me, or responded to my communication on the first night, she would have gotten her refund that night in cash. I had already went to the ATM on my way home ! Next time I sincerely hope that you handle your business like an adult. Had your story not changed repeatedly to VRBO, this entire situation could have been rectified quickly. Best wishes to you and your family. Having those beautiful little girls in the house was a pure joy ! I so enjoyed having you here !